Line is a social network and communications app that allows you send messages and call for as often as you want, free any time of the day. With it you can also make video calls, ideal if you want to communicate with friends or family that are far away. The app is also perfect if you are going to hold business meetings. Line doesn’t just offer free messages and calls, but it also has a Snap Movie that lets you capture film frames and share them with your buddies. For many people though the most important feature are the free video and voice calls. Once you have Line on your mobile device you can make calls and video calls anytime you want. You can talk for as long as you like, and the quality is very good. In addition, international calls are free as well. But Line’s strength isn’t just in the voice and video calls, as the message feature is just as efficient. 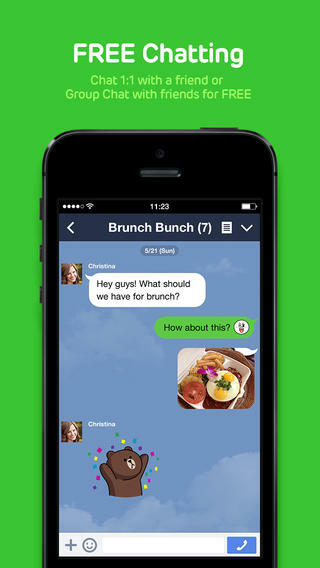 Rather than use SMS, Line makes it a breeze to send messages thanks to an intuitive interface. Line also lets you send photos, icons and other information with your messages for that personal touch. The impressive feature set doesn’t end there though, as you can also use emoji and stickers, making communication more personal and enjoyable. The app also has a timeline feature that tells you what you’ve been up to with stickers, photos, text and more. While there are a lot of other social apps out there, Line is definitely worthy of a look.